An assessment of a new, promising field. (HT to MR). [T]he people who tend to derive the greatest dollar benefit from the mortgage interest deduction are households earning $100,000 to $500,000 a year. “About two-thirds of the total benefit go to that group in the 80th through the 99th income percentiles,” Mr. Rosenberg said. For those households, by the center’s calculations, the tax benefit of the deduction amounts to about 1.5 percent of after-tax income. By way of comparison, the value to households earning $40,000 to $50,000 is closer to 0.3 percent of after-tax income; for households earning $50,000 and $75,000, it is 0.7 percent. These numbers compare the status quo to a system without any mortgage deduction at all. If instead we lowered the size of the mortgage eligible for this deduction from the current $1 million to, say, $250,000, the base broadening would have an even smaller effect on middle-income housholds. An analysis from Stanford's Michael Boskin. No, it is not an oxymoron, but a new blog. Alan Blinder and I will be speaking at the 8th Annual Gulf Coast Economics Association Teaching Conference on November 8th and 9th, 2012. Even if you can't make it to the conference in Orlando, Florida, you can watch us via a free webcast. For more information, click here. A nice, accessible analysis of the economics of higher ed from Michael Greenstone and Adam Looney. France's new 75 percent income tax on the rich may not be popular with millionaires. But it's being cheered by another group: Paris real-estate buyers. Real estate agents say that the number of multi-million-dollar real-estate listings in Paris has jumped more than 25 percent over last year -- due in part to the threat of the new income tax....[B]rokers say the 75 percent tax on the wealthiest French citizens has contributed to the decision by many of the them to sell their homes in anticipation of a possible move to another country. "Taxing capital income at a permanently lower rate than labor income would result in higher average long-term prosperity, relative to an alternative that generated the same amount of tax revenue by permanently taxing capital and labor income at equal rates instead." There was not unanimity, but about three times as many economists agreed than disagreed. Congratulations to Al Roth and Lloyd Shapley for winning the Nobel Prize today! It is well deserved. FYI to teachers of introductory economics: I use Al's article on Repugnance as a Constraint on Markets as an ancillary reading in ec 10. "If there is no consensus on the causes or solutions to serious problems, it is unreasonable to ask a political system to implement forceful actions in a sustained way. Unfortunately, this is to an important extent the case with respect to current economic difficulties, especially in the industrial world." "As a young man, Ryan held numerous amusing summer jobs, including a stint as an Oscar Mayer salesman in which he drove a Wienermobile. He envisioned eventually going to the University of Chicago for an advanced degree in economics and becoming an economist/academic, but he says he 'kept getting lured into politics.'" A nice discussion of his research using field experiments. Total employment rose by 873,000 in September. Total nonfarm payroll employment increased by 114,000 in September. To a layman, this may seem confusing. The first statement suggests a robust labor market, the second a more lackluster one. What is going on? Because the BLS conducts two surveys of labor-market conditions, it produces two measures of total employment. From the household survey, it obtains an estimate of the number of people who say they are working. From the establishment survey, it obtains an estimate of the number of workers firms have on their payrolls. 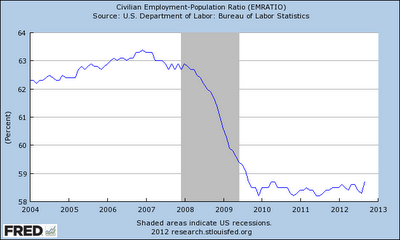 One might expect these two measures of employment to be identical, but that is not the case. Although they are positively correlated, the two measures can diverge, especially over short periods of time. A particularly large divergence occurred in the early 2000s, as the economy recovered from the recession of 2001. 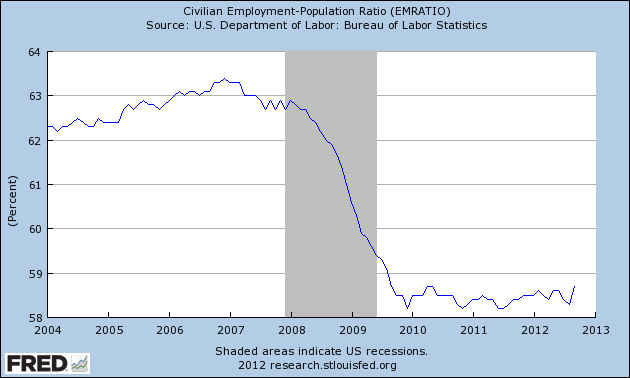 From November 2001 to August 2003, the establishment survey showed a decline in employment of 1.0 million, while the household survey showed an increase of 1.4 million. Some commentators said the economy was experiencing a “jobless recovery,” but this description applied only to the establishment data, not to the household data. Why might these two measures of employment diverge? Part of the explanation is that the surveys measure different things. For example, a person who runs his or her own business is self-employed. The household survey counts that person as working, whereas the establishment survey does not because that person does not show up on any firm’s payroll. As another example, a person who holds two jobs is counted as one employed person in the household survey but is counted twice in the establishment survey because that person would show up on the payroll of two firms. Another part of the explanation for the divergence is that surveys are imperfect. For example, when new firms start up, it may take some time before those firms are included in the establishment survey. The BLS tries to estimate employment at start-ups, but the model it uses to produce these estimates is one possible source of error. A different problem arises from how the household survey extrapolates employment among the surveyed households to the entire population. If the BLS uses incorrect estimates of the size of the population, these errors will be reflected in its estimates of household employment. One possible source of incorrect population estimates is changes in the rate of immigration, both legal and illegal. More important than the specifics of these surveys or this particular episode when they diverged is the broader lesson: all economic statistics are imperfect. Although they contain valuable information about what is happening in the economy, each one should be interpreted with a healthy dose of caution and a bit of skepticism. University of Maryland economist Phill Swagel reviews the new book by the former FDIC head.